The presidential candidate of the Peoples Democratic Party, Alhaji Atiku Abubakar, has said President Muhammadu Buhari and his party, the All Progressives Congress, can no longer be trusted because they have not kept any of the promises they made to Nigerians while soliciting their votes four years ago. Atiku said this on Tuesday during the party’s presidential rally at the Tafawa Balewa Square, Lagos. He said the PDP would provide adequate security, jobs and turn around the economy, noting that the APC had made situations worse than they met them after deceiving Nigerians to vote for them. Atiku promised the Lagos crowd that he would create jobs and tackle other problems confronting the nation if voted into power on Saturday. He said Lagos State was dear to him, adding that with the PDP in control at the centre the myriad of problems confronting the state would be effectively tackled. Atiku said, “The APC promised to create jobs for us, today there is massive unemployment. The APC promised security, but today, there is high level of insecurity in Nigeria. The APC promised us economic revival, today Nigeria is the poverty capital of the world. These are people that cannot be trusted. “I promise you that I will create jobs; I have been doing it and I will turn this country around if you vote for me. The vice presidential candidate of the party, Mr Peter Obi, and the governorship candidate of the PDP in the state, Mr Jimi Agbaje, urged the people of Lagos to troop out on Saturday and vote for the PDP. Agbaje said the Saturday polls should be used to put an end to slavery, terror and ineffective government. The National Chairman of the PDP, Uche Secondus, said the opposition party was confident of winning the presidential poll, while accusing the ruling party of planning to rig the election. 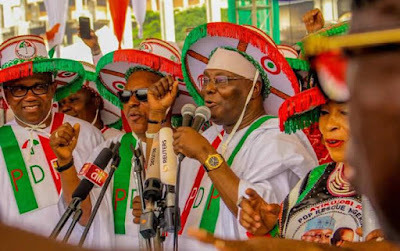 The party chairman called on Nigerians to vote for Atiku and other PDP candidates in the February 16 and March 2 elections, saying the party would return Nigeria to the path of economic development and security.